InstaSuite is new to the scene of internet marketing tools, but it’s a special newcomer. It incorporates all the major tools you’re ever going to need as you build or grow your online business, and it’s so easy to use a total newbie could get everything setup in minutes. Suzanna Theresia and Neil Napier, both well-known names in the internet marketing community, have put a lot of effort into developing InstaSuite, and bringing it to the point where it’s a disadvantage if you don’t own it. The dashboard is the classic WordPress-type dashboard you’re already familiar with, so there’s nothing new to get accustomed to, and that’s a good thing! After logging in for the first time, I thought, for a second, that I was viewing my website’s dashboard. As you can see, it’s highly intuitive. On the left-hand side, you’ll find quick links to the six incorporated tools, and links to view reports, tutorials, and the changelog. InstaSuite is regularly updated and you can view the changelog anytime to see what new features have been added after each update. At the top right corner, there’re three drop-down menus. The first one lists the number of websites you have and lets you easily switch from one to the other, edit, and create a new website. The second drop down menu contains settings options for integration, media management, and team management (I’ll get to this later). The last drop-down menu lists links for editing your profile, changing your password, and more. The body (main area) of the dashboard contains 6 conspicuous links to the 6 integrated tools (a bit redundant, if I may add). There’s also a ‘?’ button at the top right corner that provides a quick tour of the dashboard. You can activate this tour anytime you want it by clicking on this button, even if your account is 10 years old. If you don’t already know the importance of marketing funnels, I suggest you read some articles on the topic. All the big brands, both online and offline, are using marketing funnels to boost their bottom-line, and you can imitate them in minutes. InstaSuite simplifies funnel creation with its easy-to-use, drag and drop interface. Clicking the ‘Add Funnel’ button brings up a pop-up that presents you with 4 different funnel types to choose from. Of course, the most popular choice is sales funnels. After customizing and naming your funnel, you’ll be able to edit it. Editing options include picking a template, customizing, picking your settings, split testing, and more. Quick stats are available in the funnel editor that display your sales, conversions, conversion rates, and revenue. You can also reorder steps in the funnel via a drag and drop interface. Some dedicated funnel creation products don’t even have this feature! With this tool, you can add a paywall to your website and have users become members before they can access certain products/services on your website. To get started, you have to fill in the required details (title, slug (URL)) and pick your desired settings and a membership site will be created for you immediately. You can customize every aspect of the membership site, including the emails that go out when an event takes place, the required fields in the registration form, what happens when a user logs out, base currency, etc. The next steps after that are selecting a theme and setting up a product for the paywall. There’s also a member management module that allows you edit the details of your members, manually add new members, suspend or delete members, and downgrade and upgrade members. Member tracking is another crucial built-in feature. You can view members that have logged in or those who haven’t within a certain timeframe and gain access to their transaction logs. If you’d like to offer members incentives/perks, you can do so in the form of discounts and coupons. Security measures to prevent account sharing and hacking are also part of the package. Blogs are great marketing tools and you can add one to your website using the blog builder. You can publish posts promoting your products, educating visitors on how to use your products, announcing discounts, and more. Once you open the blog builder, you’ll be asked to fill in the SEO fields (title, description, keywords) before you can start blogging. The setup takes just a few seconds and there are several beautiful themes to choose from, 3 to be precise. I think, with time, more themes will be added to the blog builder and it’s something you can easily request of the owners with a simple email. Although, this isn’t a full-fledged blogging tool like WordPress, it has the simplicity of WordPress and all the features you need to add a fully functional blog to your website. It has support for menus, post categories, post tags, and widgets. You can add a custom widget too if you want. Lastly, the blog builder is optimized for SEO. The list builder removes all the intricacies of building a list so you can build a list in a step-by-step hassle-free fashion. The first step requires you to complete the SMTP setup. In this step, you can also blacklist entire domains, email addresses, and IPs. After that comes the list creation step. If you know a thing or two about building a list, you’re going to find this extremely easy. Otherwise, you may have to glance through the tutorials a bit. The list builder lets you manually add/import subscribers and save email messages so you can send them out later. If you’d like to send a message, there are two ways to do that – broadcast and sequence. Of course, the broadcast option is intended for sending messages to all subscribers or to subscribers in one of your lists at the same time whereas the sequence option is used for creating an email sequence that sends out emails at preset times and intervals. There’s also a form builder for building opt-in forms. I didn’t expect it to be this straightforward, but it is. I can’t imagine first-time users running into any roadblocks with the form builder. You can edit any element on the form by clicking on it and editing the text in the pop-up that appears afterwards. The dashboard displays basic email stats such as the total number of subscribers in your lists and the total number of emails sent along with a graphical representation of trends in subscriber acquisition over the last 7 days from the current date. The stats that most internet marketers value more than anything else – click and open rates – are available too for each email sent. Give your customers the opportunity to make money through an affiliate center that has all the makings of a good affiliate program. The settings allow you specify whether you want to allow only customers to promote your products or anybody, manually approve affiliates or not, and set the length of the cookie for as long as you want. The affiliate signup form and the emails affiliates receive can be customized. Other cool features include the ability to setup commission plans, pay out commissions, support for recurring commissions, and automatic tracking and calculation of unpaid commissions. The affiliate management module is where you approve/unapprove affiliates, edit their details, and log into their individual accounts. There is a provision for promotional tools to aid affiliates in promoting your products/services. These include banners and email swipes. The support desk adds a platform for providing support to clients on your website. It comes with all the standard features of support desks/help centers. After logging in, you’ll be asked to create a support email address. Any emails sent to that address will land in your help center as a new ticket. You can add staff members and assign to them different roles once you’re ready to roll. The help center is customizable with themes and support for canned responses ensures you answer tickets on common queries lightning fast. If you’ve compiled a list of frequently asked questions, you can store them and their answers in the knowledgebase and refer clients to that page. You can also prioritize tickets based on importance/urgency, view the ticket history of clients, and tag their tickets so you can quickly find them in the future. The media manager is where you store and keep images organized for easy access whenever you want to embed them. It’s similar to WordPress’ media library. Another important feature that I can’t help but mention is the fact that you can edit your pages on any device, smartphones and tablets included, via a drag and drop interface. It’s so feature-rich I couldn’t ask for more. You save (a lot of) money: Just imagine how much it would cost you to purchase all the tools included in InstaSuite separately. I’ll leave the math to you. Hosting is free: You pay nothing for hosting. Your membership site, blog, opt-in form and every single page you create are all hosted for you on lightning fast secure servers with unlimited bandwidth. You have the option of using your own server or web host if that’s what you prefer. It’s an all-in-one marketing platform: Once you purchase InstaSuite, you won’t need to purchase any other tool for marketing your business online. Period! There’s no software to install: All the tools InstaSuite offers are hosted in the cloud. You need just your login details to access them. Detailed statistics for everything: Stats are available to keep you informed of the performance of your pages and campaigns in every tool InstaSuite offers. You won’t need to buy third-party tracking tools unless you simply want to. Seamless integration with third party tools: The tools supported include popular email marketing, social marketing, and optimization tools. Build a team and manage it: Just like WordPress, you can add team members with different roles so they can log into InstaSuite and carry out tasks without having to share login details with you or their colleagues. Some of the tools might be too basic for experienced users: Although this is entirely a matter of opinion and I don’t think many will need more than what is already offered, I think experienced marketers may prefer advanced versions of some of the tools. I’m an experienced marketer, but I think I would use WordPress to blog rather than the built-in blog builder. The blog builder is the only tool I’m not satisfied with. Other experienced marketers may be dissatisfied with some other tool. However, InstaSuite is perfect for newbies and experienced marketers alike. It’s a complete package; only picky people like me would complain. Aside from this, I find nothing else wanting in the InstaSuite package. 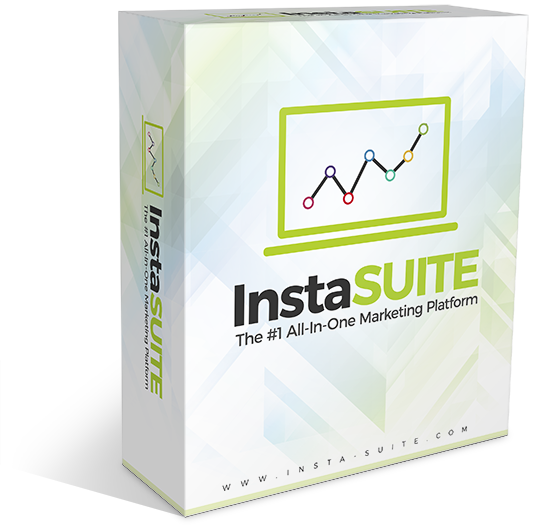 InstaSuite is an internet marketer’s dream tool. Now you can live out your fantasy in style. I see no reason why anyone would be unwilling to purchase InstaSuite, unless, of course, they don’t have an online business or aren’t interested in creating one. Whether you think you need it or you don’t, click here to learn more about InstaSuite and how it can help you. If you have any questions or comments, I’d be more than happy to hear what you have to say.